Littlest Sweet Shop: New arrivals for February - Gourmet popcorn, Fruit lollipops, Latte Art, and new Littlest Groceries!! New arrivals for February - Gourmet popcorn, Fruit lollipops, Latte Art, and new Littlest Groceries!! Hope you had a great Valentine's Day yesterday. We had a great time selling chocolates and candy so today we have new stock that just came in! There will also be a new range of items from our own Littlest Groceries with original artwork by Inksalad Illustrations. This cute Japanese Strawberry Shortcake slices comes in white and pink. Each cake is frosted with a layer of cool and fresh cream - YUMMY! There are 3 layers of sponge cake with white frosting in between. The strawberry slices in the cream look so real! 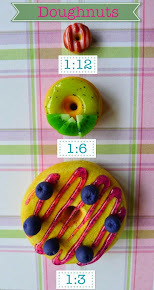 Each piece have been painted individuallyy to give the strawberries more 'depth'. Fresh strawberry slices and cream. Soft sponge cake layers. Also new to our Beverage menu is Latte Art. You can choose to have a cocoa powder stencil or chocolate drawing on the foam. Comes in white mugs that have been up cycled. There are tons of new chocolate and candy which is now available in store. The chocolate will be a great new addition to the chocolate range in the Sweets Boutique. This is an updated version of our Chocolate Bar. The new version is smaller and with more small details. This also comes in 1:12 scale which is also a nice size as a mini chocolate bar in 1:6 scale. Chocolate Buttons is the latest selection in the Chocolate Pick'n Mix. Each piece is tiny and comes in Milk Chocolate, White Chocolate, Dark Chocolate, and Strawberry Milk flavours. It is also the candy we use when we are building the roof of a Gingerbread House. Another new addition to the Chocolate Pick'n Mix are these creamy looking Moulded Chocolate Swirls. Made from the highest quality chocolate and available in dark or milk chocolate flavours. It even comes in 1:12 scale. Another new item in our Sweets Boutique is Gourmet Popcorn. This popcorn is a larger size because it was air-popped and coated in generous molten candy. Gourmet popcorn is currently available in Berry Rainbow, Chocolate and Caramel. XXL Portion of Gourmet Popcorn to fill a big glass bowl. Perfect for parties or home movies. The Fruit Lollipops have been updated to be slightly thinner and a new recipe was used for additional hard candy clarity. They come in Cherry, Pineapple, Lime, Watermelon, and Grape flavours. L-R: Cherry, Pineapple, Lime, Watermelon and Grape lollipops. You can also order the rainbow lollipop stand from us. Liège Waffles is a soft sugar dough recipe from Belgium. Our version is small, crunchy on the outside and deliciously sweet! This is our 3rd update on this type of waffle so we have definitely come a long way to make them look tasty and real. The best part is that it also comes in 1:12 scale. Comes in plain or you can have it coated on one side with chocolate or white chocolate. Liège Waffles from Littlest Sweet Shop. Liège Waffles available in chocolate, plain and white chocolate. Time to debut our new range of Littlest Groceries! I have been so excited about this since I was working on the designs since last summer and it is finally here! The artwork for the boxes and packaging is an original design by Inksalad Illustrations. I also plan to make the contents of each item in detail so you can also purchase them separately or together. It does take a long time to model the contents especially tiny items like cornflakes (which has to be modelled individually) but it will be listed in the shop very soon. We will also be stocking up fruits and vegetables into this range so please be patient for that as well. The boxes and packaging are hand-assembled and printed in hi-resolution to give it a professional finish. Our cereals come in 3 different variants and the labels are in Japanese on one side and English on the other side. Biscuit Snack from Littlest Sweet Shop in Banana, Chocolate and Strawberry. You can also buy packets of crisps in 3 different variants. FYI Super Ring is a cheese hoop snack. We are still developing the loose contents for each product so please stay tuned. This box of Fancy gems comes in 1:12 scale. Perfect for the dollhouse collector. Thank you for visiting Littlest Sweet Shop today and we hope you like our new arrivals. 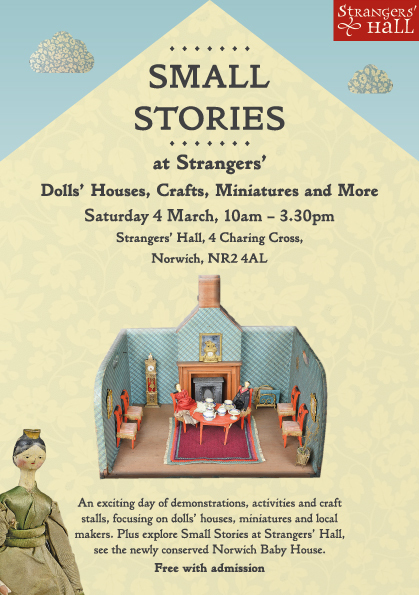 There will be some commission update news next week and I will also be busy setting up shop at a doll's house exhibition called 'Small Stories'. If you are in Norwich, please do come and say hello! We will be selling some miniatures and Littlest Sweet Shop accessories. I am also working on a tutorial for this Valentine's Day tart in co-operation with a Parisian craft store - La Petite Épicerie. The tutorial will be permanently available on our website so if you were ever interested in our recipes in making miniatures, make sure to visit us again end of this month. Happy Belated Valentine's Day and Good-Bye!